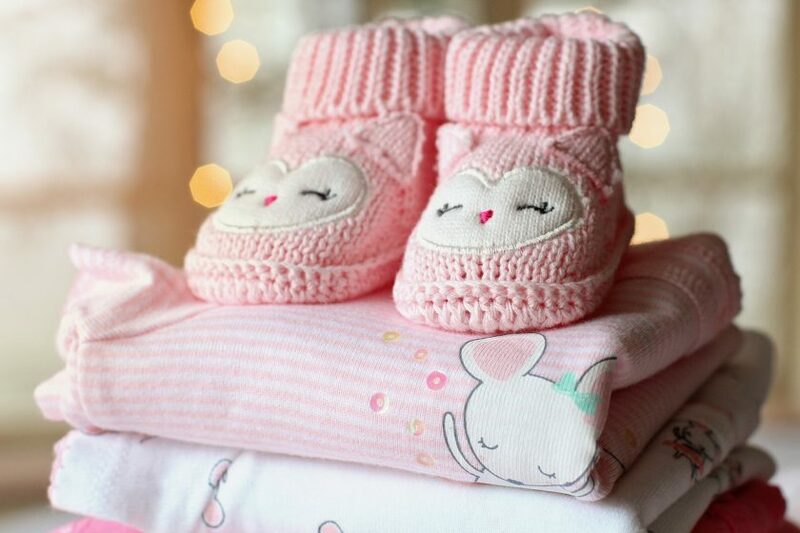 Any parent on a tight budget and a growing family knows that finding a reliable source for hand-me-downs is a key factor to saving big on clothes. Even with all the free brand new clothes I get, hand-me-downs still play a huge role in our savings on clothes. But what if you run out of sources? Or don’t have any to begin with? Don’t despair! 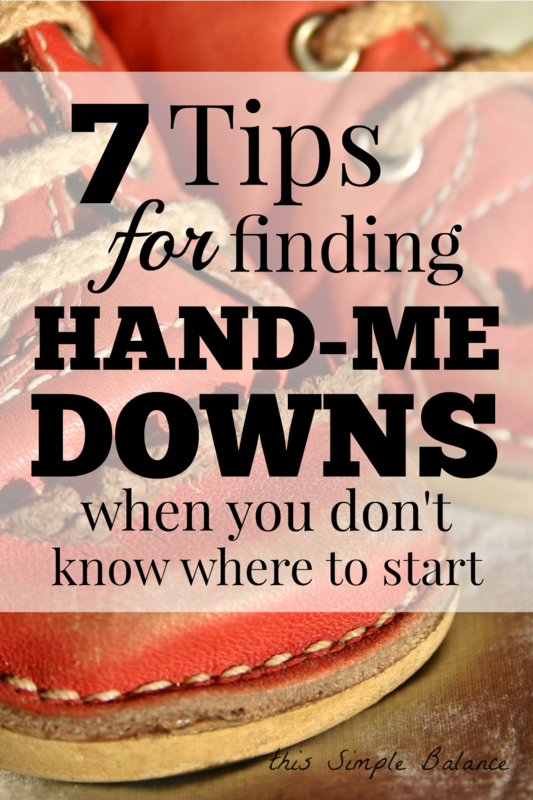 I’m going to give you several ideas on how to get your hands on some good hand-me-downs. I don’t know a single parent who rejects hand-me-down offers, even ones with much bigger incomes who can afford to be a little more choosy with their clothing selection. Kids grow out of clothes so fast that spending money on new clothes just makes you wince (which is why I try to get as many clothes for free as I can). While I have started to stop myself from taking anything free offered to me (because minimalism), I always accept bags of hand-me-downs. If I find even five or six things in a bag of fifty pieces, I’ve saved a ton. I also then have more to offer someone else. But first, let’s talk about our feelings about needing hand-me-downs to begin with. And I’m not looking for noble reasons either. While I love the earth and want it to thrive for future generations, I’m not into hand-me-downs or thrifting because I want to reuse resources. Frankly, I want to save the money for other things; it’s that simple. Let’s address those feelings right off the bat, shall we? Because overcoming them is key to saving money on clothes. Is one of you staying home with your kids? Awesome! You’re sacrificing in order to raise citizens who will be as whole as possible (we’re learning, right? ), contributing members of society. Are you a two income household in order to make ends meet (or just because you both love your jobs)? Awesome! You’re working hard to feed and clothe your precious kiddos and keep a roof over their head. Whatever situation you are in, when you are living on a tight budget, every dollar counts. Every dollar you save on clothes will help your kids as you strive to achieve financial freedom and stability for your entire family. Alrighty? Did that help? Now let’s get us some hand-me-downs! 1) Believe people want to give you hand-me-downs. Every time you feel awkward or embarrassed asking for hand-me-downs, remind yourself that many people enjoy giving hand-me downs. They appreciate knowing personally the recipient of their child’s old clothes. I love seeing daughter’s clothes on my friends’ kids. I donate some things to the Goodwill or other thrift stores as needed, but I prefer to pass them directly to another person with a face and a name. It sounds selfish, but when I put those hand-me-downs into that grateful parents’ hands, I feel all the good feels from my giving that I don’t get when I drop a bag off at Goodwill. 2) Ask, ask, and ask some more. If you live on a tight budget, you need to get good at asking for things. I’m not saying scoop up EVERY free thing at the expense of others who need it. What I am saying is that you have not because you ask not. Remember the first point: many families who are going to donate their baby clothes, toys, and gear anyways would LOVE to give it directly to someone they know. Practice asking in a polite, unassuming way. Don’t know what to say? Try, “Hey friend! We are on the lookout for used toys, clothes and baby gear. When you’re looking to pass things along, please keep us in mind if you don’t already have someone to pass things to.” Tweak it, but that’s the general idea. 3) Ask on social media. Still struggle with asking directly? Social media can be a great way to practice! It also broadens your audience to friends you may have lost touch with or do not see frequently in person. Make a general appeal to your social network. Feel free to use the sample ask above if you’re stumped with what to say. 4) Post an ad on Freecycle. Remember what I said before about why I’m NOT into hand-me-downs? Well, luckily there are people out there are love saving the earth and seeing resources get their fullest use possible. At Freecycle, you’ll find people WANT to give things away for free because it consists of a community passionate about saving the planet, reducing waste, and sharing resources. One of the few stipulations is that you offer items at one point or another (see number 6). 5) Think beyond your city/town. Just because you have friends who live in another state doesn’t rule them out as a good source of hand-me-downs. Or do you have relatives with kids just older than yours, but they live across the country? If you’ve never reached out to them before, it’s worth getting in touch! Offer to cover the cost of shipping, which will still likely be cheaper than a lot of clothes on Craigslist or Ebay. You also are far more likely to get several coordinating clothes this way, making it easier for your kids to mix and match. If you want to be the recipient of others’ generosity, practice generosity yourself. Offer hand-me-downs to friends. If you don’t know anyone with same gender kids younger than yours, ask around. Almost every parent I know loves hand-me-downs (even the particular ones!). There is usually something you can use in a bag of hand-me-downs. Make sure to clarify what you want them to do with the rest – pass them along, do what you want, or return them. If you want to help yourself and others generate a steady source of clothes, offer to host (or administrate) a clothing swap. Get a team together if you don’t love every aspect – marketing, networking to get more guests, and hospitality are all key to a successful swap. Be sure to decide in advance on a way to exchange items fairly. You don’t want one person taking home the majority of clothes, leaving nothing for everyone else. You can try giving attendees a ticket per item they bring to the swap. The number of tickets you get at the door equals the number of items you can take home with you. Decide what types of clothes you will exchange, and try to invite guests with a wide variety of life stages so everyone will have choices. Create an evite to make it official, and ask for participants sizes and kids’ ages. Consider asking participants to bring a baked good or beverage – make it fun! What are some of your best tips for finding hand-me-downs? Share in the comments!